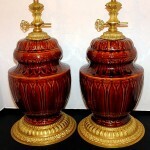 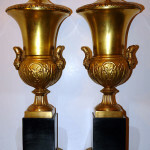 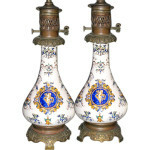 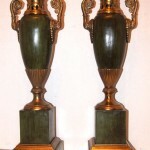 Pair of Circa 1900 French onyx and enamel urn on pedestal lamps. 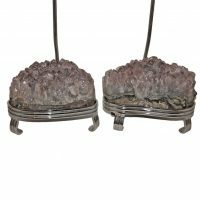 Measurements: Height of Body: 20" Diameter: 7"
A pair of circa 1960's silver finish Italian table lamps with amethyst stones. 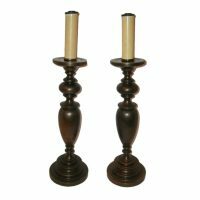 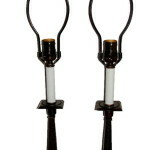 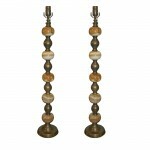 Measurements: Height to shade rest: 35"
Pair of circa 1920's American candlesticks mounted as lamps. 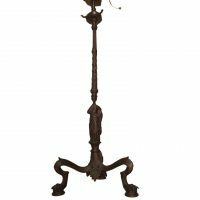 Measurements: Height of body: 8.5"
An English circa 1920's patinated bronze boulliote lamp with original patina and 3 lights. 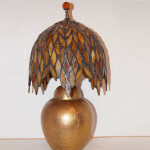 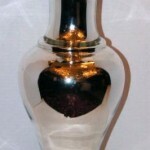 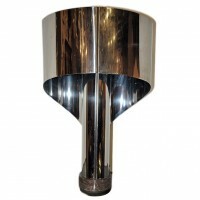 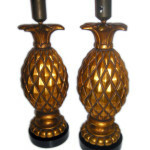 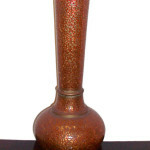 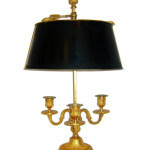 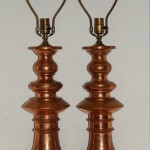 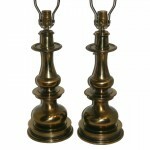 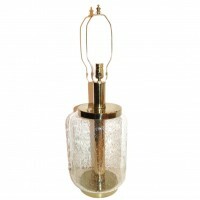 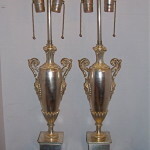 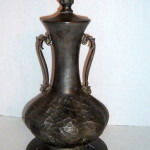 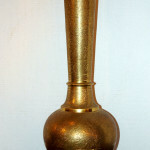 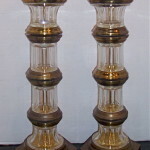 Measurements: Height (including shade): 25" Diameter of shade: 16"
A pair of circa 1940s Italian bronze table lamps. 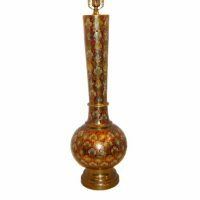 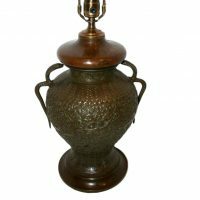 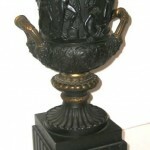 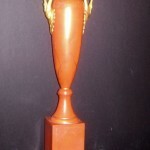 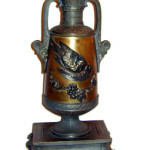 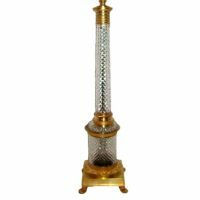 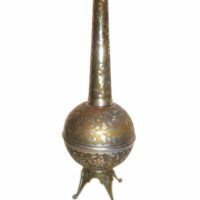 Measurements Height: 26" total height Widest Diameter: 8.25"
An elaborately etched brass table lamp with silver foliage and floral detail on body. 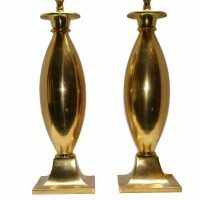 Standing on 4 stylized feet. 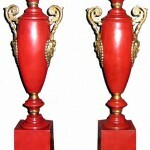 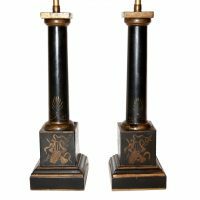 Measurements: Height of Body: 29"
A pair of circa 1920's hand-painted tole column lamps. 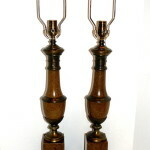 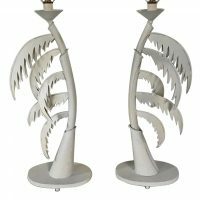 Measurements: Height of Body: 14" Height to Shade Rest: 24"
Pair of 1960's Italian palm-shaped painted tole table lamps. 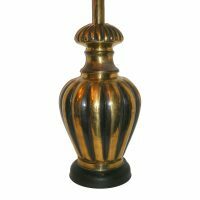 Measurements: Height of Body: 22" Width: 9" Depth: 5"
A single large circa 1940's hammered brass Italian table lamp with original patina. 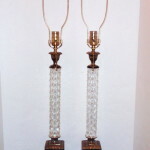 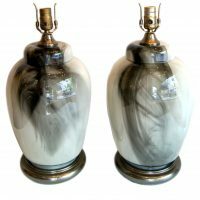 Measurements: Height of body: 29"
Pair of 1960's French porcelain lamps with nickel plated bodies Measurements: Height of body: 23" Diameter: 10"
Pair of 1940's French polished brass table lamps. 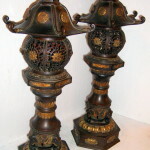 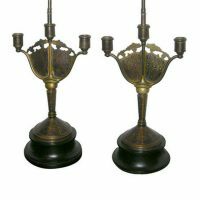 Measurements: Height of body: 19" Diameter of base: 10.5"
Pair of large 1940's repousse' brass table lamps with bamboo pattern on body, original patina and wooden bases. 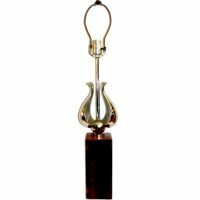 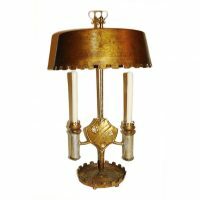 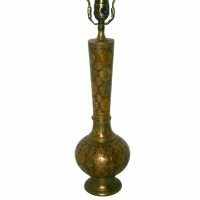 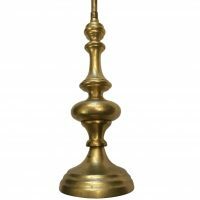 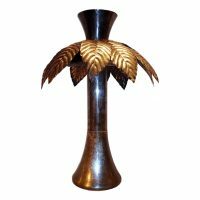 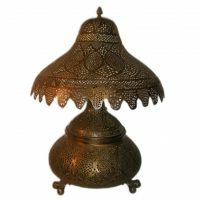 Measurements: Height of Body: 23"
A single circa 1920's Turkish brass lamp with pierced body and shade with arabesque decorations. 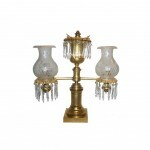 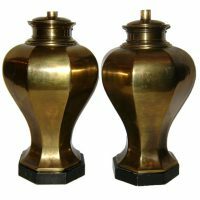 Measurements Height of body: 24" Diameter of shade: 20"
Pair of 1940's Italian gilt bronze table lamps. 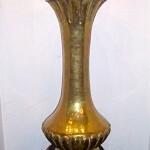 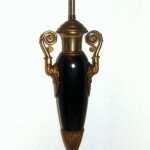 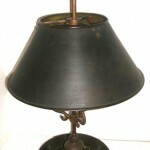 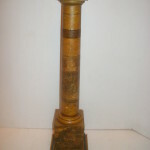 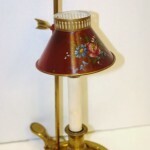 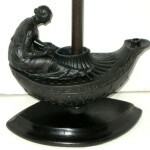 Measurements: Height of Body: 19.5" Height to shade rest: 28.5"
A circa 1920 French column shaped lamp , original patina. 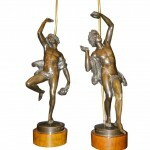 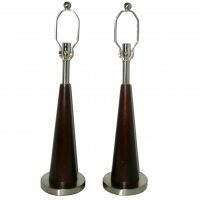 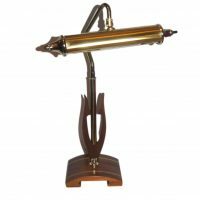 A pair of circa 1930's Italian patinated bronze table lamps. 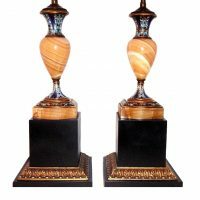 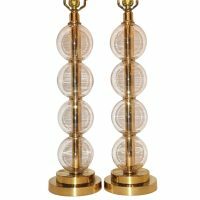 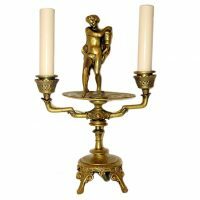 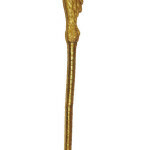 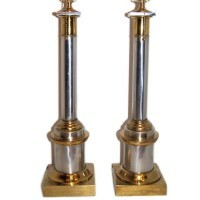 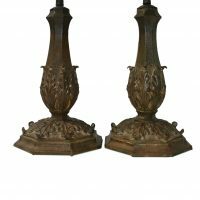 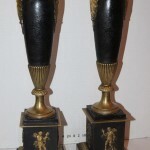 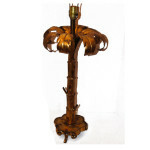 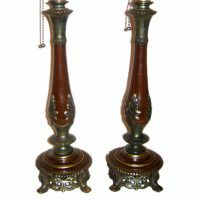 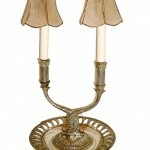 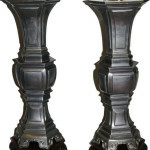 Measurements: Height of body: 15"
Pair of circa 1900 French bronze table lamps in the form of tapered columns. 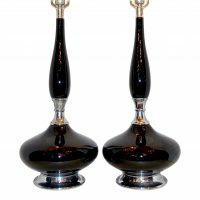 Measurements Height of Body: 24" Height to Shade Rest: 35"
Pair of late 1940's French gray and white "smoke" glass table lamps Measurements: Height of Body: 17" Height to Shade Rest: 29"
Pair of circa 1960's blown amber glass table lamps with gilt bases. 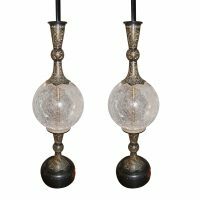 Measurements: Height of body: 19"
A pair of circa 1960's French blown glass balls table lamps. 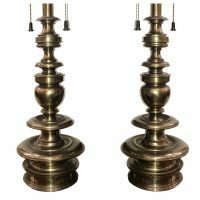 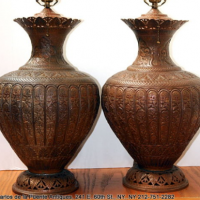 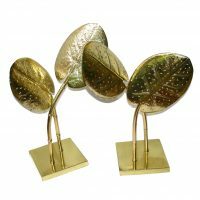 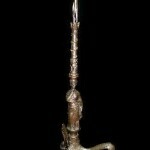 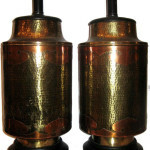 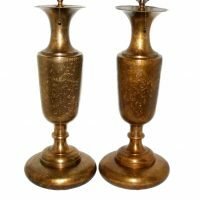 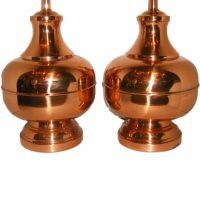 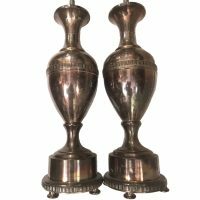 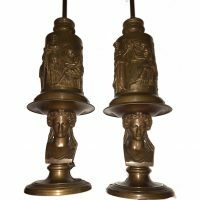 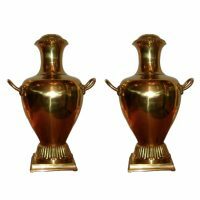 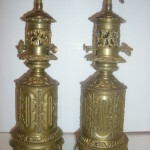 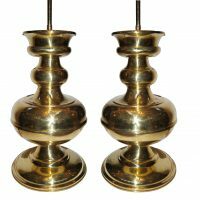 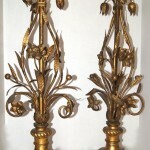 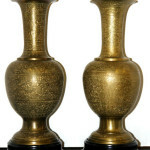 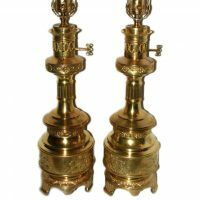 Measurements: Height of body: 22"
Pair of circa 1920's Turkish etched brass table lamps with foliage motif. 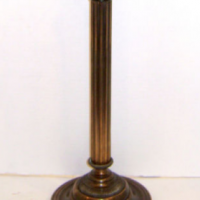 Measurements: Height of body: 20.5" Height to shade rest: 30"